You are currently viewing archive for July 2005. Wade Boggs entered the Hall of Fame today. Although he entered the hall wearing a Red Sox cap, he will still be a beloved Yankee in helping them claim their title in '96. My favorite Wade Boggs moment was when he pitched against the then Anaheim Angels. Wade Boggs pitches one scoreless inning of relief for the Yankees in a blowout loss to the Anaheim Angels. Boggs threw 16 knuckleballs and one fastball that clocked 74 mph. "I was Phil Niekro and Charlie Hough all rolled into one," said a beaming Boggs. What's your favorite Boggs moment? Last year, the big three (Mo, Gordon, Quantrill) got a lot of action - some would say they were overused. Plenty of people were saying that Flash's problems in the postseason were due to him being tired. So, I thought that I'd take a look and see how this year's big three (Mo, Gordon, Sturtze) are doing as compared to them through 104 team games. So, as you can see... Mariano has pitched in 10 less games, while Gordon is on the same pace as last year. This years number 3 man, Sturtze, has pitched in 18 less games than last year's number 3 man, Quantrill had through the same period of him. Hopefully this will help us down the stretch as they are (hopefully) less likely to have issues. With the Unit on the mound and a called-up replacement for the Angels, one would figure it would be a good day for Yankees baseball. The excitement was there as the Yanks had to rally with four runs in the eighth to tie the game 6-6. The game was almost won in the 9th when Andy Philips hit a smoker down the third base line. Maicer Izturis was there to make the diving grab, and threw out Philips at first. The game then went into extra innings with the Angels going ahead in the 10th off of Vlad's soft single into center. Bernie William's stretched out a double to lead off the bottom of the 10th with Womack replacing him obviously for speed. Interesting to say that its one of the few times I was glad Torre replaced Bernie with Womack. After Posada struck out, Jeter was walked after a wild pitch by the Angels Kevin Gregg. Womack advanced to third. Cano struck out, then Gary Sheffield hit a hard drive to Angels' shortstop Orlando Cabrera. In Michael Kay's words, it was a "tough hop" and he could not make the out at first. Womack scored to tie the game at 7-7. The play of the game happened in the 9th when Hideki Matsui, yesterday's hero, hit a long fly ball over the head of center fielder Chone Figgin's head. The ball bounced off the wall, which allowed Matsui to round the bases for an easy triple. I was out of my seat! The Angels then made an interesting move. They pulled Figgin's into the infield for a five man infield. They intentionally walked Jason Giambi, struck out Phillips, then Womack came to the plate. Womack was able to ground the ball between the heavy defensive infield for the game winning single to bring in Matsui for the win! Jason Giami hit his 13th and 14th homers for the month of July. The first hit that many in one month since Mickey Mantle did so back in '61. Giambi also hit his 300th HR in his career. Congratulations Jason! These last two days of Yankee baseball have been very thrilling. It feels like the postseason, and we're not playing the Red Sox. If you feel that way too, pinch yourself. It's only July with two more months of regular season ball to play and the Yanks are 2.5 games out of first. The Yanks go back on the road this Tuesday night facing the Cleveland Indians at the Jake. For the Yankees Al Leiter (4-9, 6.20 ERA) takes on Scott Elarton (6-5, 4.54 ERA). Game time: 7:05pm et. We are now an hour past the deadline. With the exception of the Groom trade, not a thing. Oh well, can't say it wasn't somewhat expected. Maybe August will bring some deals. "I wouldn't encourage anybody else to come here thinking you are going to get an opportunity because unless you are one of Joe's boys you are not going to get much of a shot; unless you are one of his three guys," Groom told the Post. "The same thing happened to me in Baltimore [last year]. I went 15 days [without pitching] and [Torre] is where [Oriole manager Lee] Mazzilli learned it." Continued Groom; "I didn't get a fair shake here. Every time I pitched in key situations here I did the job," Groom told the Post. "Then I became a mop-up guy and didn't get into any games. Guys come here and they don't get a chance unless they are one of the boys." I'm going to call this sour grapes because it is nonsense. Now, some people feel Joe doesn't use the pitching staff correctly. Some people feel that Groom may not have been used as he was and that he should have faced lefties only (despite the fact that Mo, Flash, Sturtze and Rodriguez have all been more effective against them this season and every one of those 4 but Sturtze has been better against lefties in their career). That's beside the point and not really related to what Groom said, in my book. First of all, Joe is loyal... there is no doubt about it. It's a good trait to have. And if you produce for him or you show him something, he'll be comfortable with you and he'll continue to call your number. That's called trust. Trust is something you build and not something you get right away. In this regard, every manager has their "boys" a.k.a their go to relievers. But, that's not what Groom is implying. Not to me, anyway. He's more saying that Joe is the little league coach who starts his completely less capable son at short stop. Mariano Rivera, Tom Gordon and Tanyon Sturtze are the proverbial coaches sons. It's quite an insult to Mo, but it's also an insult to Flash and Tanyon. Was Mo one of "Joe's boys" when Joe was hired? No. He became Joe's boy because of his performance. Was Gordon Joe's boy when he signed here? No. He's been our 2nd best RP since opening day 2004. And that's why his number is called. Sturtze isn't as clear, but he has been semi reliable and once you look at the numbers, you will see that they show someone who has simply and clearly outperformed Groom. Last year, for instance. Lefties hit .333 off Groom. They hit .261 off Strutze. Righties hit .290 off Groom and they hit .246 off Strutze. This year, Strutze has again put himself far ahead of Groom in these categories. And that is why he is one of "Joe's boys" a.k.a. someone who pitches a lot - because he deserves to because of his performance! When you've pitched 739 games and have an ERA of 4.63 as Groom had coming into this season, everyone knows what you're about. If he wasn't a lefty, would he be pitching in the majors? Perhaps, but not nearly as much. You've had a million opportunities. In 2003, batters hit .309 off Groom. In 2004, batters hit .309 off Groom. This season, where he has been allowed to pitch 24 games, batters have hit .305 off him. I mean... newsflash: the probable reason you went 15 days without pitching in Baltimore is because you're supposed to get lefties out and they were crushing you! He hadn't earned anyones trust and it was unrealistic of him to expect more opportunities than that when he is on a bullpen that features relievers clearly more capable than him at getting both righties and lefties out and on a team that is trying to get to the playoffs where every loss counts. That's what happens when your on a staff with your betters - you don't get a lot of chances and when you get those chances, you have to take advantage or you won't get more. There is nothing strange or wrong about that. I hope he never pitches for the Yankees again. He shouldn't - unless he apologizes for what he said. These comments lead me to believe there might be something else going on here that the Yankees are not going to tell us. Perhaps an attitude issue? Again, all speculative on my part, but it seems strange that we'd go with Embree and Franklin over Groom, when he has performed better than both of them. Edit: He's been dealt to Arizona for a PTBNL or cash. Works for me. Pitchers being discussed include Ron Villone, Jamie Moyer, Kevin Millwood (supposedly Cash is trying to find a third team to get them what they want), Jason Johnson, Eddie Guardado, Bob Howry, Scott Sauerbeck, Scott Eyre, Bob Wickman and Gil Meche. We are said to have lost interest in Mark Redman. The Yankees talked to Texas last week about Gary Matthews, but unless the Rangers can get Mike Cameron from the Mets, they can't move Matthews, who is known for his defensive prowess. Rangers manager Buck Showalter had Womack in Arizona and likes him. Nationals GM Jim Bowden has long been a Womack admirer. Talks between the Nationals and Yankees have been ongoing, but Washington is leery of the $2 million owed on Womack's contract for next year. They could send the Yankees Marlon Byrd. The Marlins' Juan Pierre? Forget him. "He is our owner's favorite player," a Marlins official said. "If we traded him, we would all be looking for jobs." With Seattle having dealt Randy Winn to the Giants last night, the Yankees were focusing their attention on other outfielders, including Larry Bigbie of Colorado. The Rockies got Bigbie from Baltimore on Friday night so they could flip him to Boston for catching prospect Kelly Shoppach. But because Shoppach was involved in the three-way Ramirez talks, the Red Sox backed out, angering Rockies GM Dan O'Dowd. Bigbie is interesting. I was looking through some clips at MLB.com and it looks like Bigbie can play some defense. He has played 58 games in center, including 6 this year. From the few clips on MLB.com, I think he's probably a decent (at least) defensive solution for the rest of the year. He's 27 and has a career batting average of .271. He would become a free agent at the end of the season. I'm thinking it would be nice if we could pull of deals for Millwood and Bigbie. With both being FAs at the end of the year, it'll be tough for us to deal good prospects which will make it tougher for us to get them. Via the New York Daily News, the New York Post, The New York Times, The Star-Ledger, Newsday.com and the Beaver County Times via Pro Sports Daily. Shawn Chacon's first start went well as he allowed just 1 unearned run on 4 hits and 3 walks over 6 innings. He left the game with a 3-1 lead on a 2 RBI double by Jeter in the 2nd and a Bernie Williams solo shot in 6th. It was after that that we got into trouble. Felix Rodriguez (1 batter, didn't record an out), Alan Embree (2 batters, didn't record an out) and Tom Gordon combined to allow 7 runs (5 of them earned) in just an inning of work. Wayne Franklin came in with a man on 2nd and proceeded to retire three consecutive batters to prevent the runner from scoring. Entering the bottom of the 8th, the Yankees are down 4. A-Rod made an out, followed by a Matsui single. Giambi hit a shot to deep right to put the Yankees down by 2 runs. K-Rod came in and retired Posada and Bernie. Mo pitched a 1-2-3 ninth as he struck out Erstad and Vladdy (Seamus tells me he made Vladdy look bad) and got Garret Anderson to ground out to first. He now finds his ERA at 0.81. ... He is amazing. Now, we head to the 9th. The Angels are going to ask K-Rod to give them 1 and 2/3 innings. He'll face 9, 1, 2 (Womack, Jeter, Cano). Womack walks. He proceeds to steal second. Then Jeter walks. Cano strikes out. Womack and Jeter advance on a wild pitch. Then... Gary walks. Then... A-Rod walks and scores Womack. Yes... that's right - 4 walks. And now we're only down 1 with Matsui up. Matsui doubles to deep left center and Jeter and Sheffield score - Yankees win 8-7. Sweetness. Giambi was 3 for 3 on the day with 1 HR, 2 RBI and a walk. Matsui was 2 for 5 with 2 RBI and 1 run. Bernie was 2 for 4 with 1 HR and 2 runs. Womack was 2 for 3 with 2 runs a walk and 3 stolen bases (bringing his total up to 23). Jeter (1 R, 2 RBI, 1 walk), A-Rod (1 RBI, 1 walk) and Sheffield (1 run) also added hits of their own. Cano and Posada were the only Yankees without a hit. Randy Johnson goes against Chris Bootcheck (second start of his career, first since 2003) tomorrow at 1:05 PM eastern time. Minor signing: Yanks get former Red Sox reliever Alan Embree. Looking at his numbers, I'm not terribly impressed... for his career, he's held lefties to a .234 batting average while holding righties to a .261. I honestly thought he was better than this, for some reason... his career numbers are 29-32 with a 4.62 ERA in 611 games. On the upside, he has pitched in 30 postseason games, compiling a solid 1.69 ERA (1-0in 21 and 1/3). "I feel like the Statue of Liberty. 'Give me your tired, your poor, your huddled masses.'" lol. So, what will Cash pull off? I'm impressed, so far, with him holding out on dealing any of the top prospects that we have. As can be expected, lots of names are being floated around. Kevin Millwood is interesting. He's 5-9 this year with a (most importantly) 3.18 ERA. Better yet, he's been a good postseason pitcher. In 9 games (7 of them started and all of them with the Braves), he is 3-3 with a 3.92 ERA. He's 30 years old and is set to be a free agent after the season. The Yankees wasted a good outing from Moose, losing 4-1 to the Angels. Mike went 8 full innings, allowing just 3 runs (all in the second inning) on 8 hits. Sturtze pitched the 9th, allowing an ER of his own. The Angels staff, meanwhile, was able to hold the Yankees to 1 run on 7 hits. The lone run, a Tino Martinez homer off of starter Ervin Santana (who went 6 and 1/3), came in the 7th. Tino has 35 hits on the year. 16 (or approximately 43%) of them are home runs. Jeter was the only Yankee with 2 hits, pulling his average up to .300. We've now fallen to 2.5 games back in the division and 2.0 games back in the wild card. Shawn Chacon (1-4, 4.09 - probably 10-7 or 9-6 if he had that with the Yankees all year!) makes his Yankee debut today against Paul Byrd (9-7, 4.10). "Not many pitchers leave Coors Field and get worse. I'm getting a good opportunity here." Good luck, Shawn. Welcome to New York. With Brown headed to the DL yet again, the Yankees have acquired Shawn Chacon from the Rockies for Ramon Ramirez and Eduardo Sierra. It's an interesting deal because we don't give up any of our main bargaining chips (I don't think) and we get a 27 year old starter who has a 3.12 ERA away from Coors this year. Ignore the 1-7 record and focus on the 4.09 ERA (including 4.97 in Coors). He is a free agent after this season. He's been a Rockie for his entire career and has overall numbers of 24-45 with a 5.20 ERA. Not pretty. But, the numbers this year away from Coors are encouraging. "Saturday we have a starter now. It's as simple as that," Yankees general manager Brian Cashman said. "Our team is working hard on the field. We're working hard in the front office to be in a position to improve the club. It seems like we've been plugging holes on the run the last few weeks at an unusual pace." One other thought that comes to mind is that Chacon does have some value in that he is young and has pitched reasonably well this year. We could package him to another team for a better SP or something of that nature, as well. Just a thought. Small? Who is he? I'm sure there are a few band-wagon Yankee fans out there who only keep up with the Yanks in the postseason. I'm sure if someone like that asked you who pitched for the Yankees today, and you replied, "Small pitched," they would sure do a double take, or ask you, "Who??" Remember the name. I'm loving the way he pitches. He works cleanly through his count. And when I hear that he is pitching in place of Kevin Brown I feel good about our chances. That being said Aaron Small pitched seven superb innings today in the Yankees win. He gave up three runs and six hits. He gave up NO walks and struck out one. Remember, he is pitching in Yankee Stadium, and I'm sure his nerves were jumping. But it didn't show. He smoothly retired his last 12 batters in order. Flash Gordon pitched the eighth and Mo Rivera pitched the ninth for his 28th save of the season. His 28th straight save, after blowing the first two chances of the season verses the Red Sox. Without Johan Santana on the mound, the Yanks bats were alive. Gary Sheffield was 2-4 and drove in four of the six Yankee runs. He planted a three run homer in the first against Minnesota's Joe Mays. The Yanks face another Santana with the Angels tomorrow night. Ervin Santana (5-4, 5.64 ERA) takes on Mike "Moose" Mussina (10-5 3.83 ERA) at the Stadium. Game time 7:05pm et. All time HR leader Hank Aaron had 342 career HRs at age 30. A-Rod has 409. Through 30, more than anyone ever. All time RBI leader Hank Aaron had 1,121 career RBIs at age 30. A-Rod has 1,176. Through 30, third behind Jimmie Foxx and Mel Ott. All time run scoring leader Rickey Henderson had 1,058 career runs at age 30. A-Rod has 1,197. Through 30, fourth behind Mel Ott, Mickey Mantle and Jimmie Foxx. 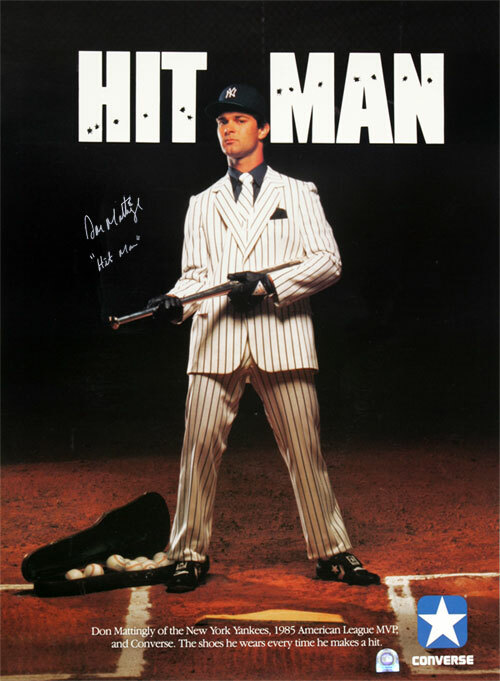 All time hit leader Pete Rose had 1,540 career hits at age 30. A-Rod has 1,824. Through 30, tenth behind Ty Cobb, Mel Ott, Rogers Hornsby, Hank Aaron, Vada Pinson, Robin Yount, Jimmie Foxx, Joe Medwick and Al Kaline. All time total bases leader Hank Aaron had 3,399 career total bases at age 30. A-Rod has 3,425. Through 30, second behind Jimmie Foxx. All time extra base hits leader Hank Aaron had 740 career extra base hits at age 30. A-Rod has 760. Through 30, second behind Jimmie Foxx (jeez, that guy's everywhere). The Yankees looked a bit outmatched last night against Johan Santana as the Twins' ace pitched seven shutout innings en route to a 7-3 loss for the Yankees against Minnesota. The Yankees made a bit of a run once Ron Gardenhire went to his bullpen. Tino Martinez reached on an error in the 8th with the bases loaded which scored two runs and cut the Twins' lead to 6-3, but it was too little too late. Justin Morneau capped it off in the top of the 9th with a solo shot to make it 7-3 and that's how it ended. Al Leiter struggled on the mound as he threw 115 pitches in only 5 innings, but he kept the Yankees in the ballgame as he only gave up one run. Tanyon Sturtze had a rough outing as he gave up three runs in the 7th and Scott Proctor gave up two in the 8th. A notable moment from last night's game was Seamus Molloy making a complete idiot out of himself as he jumped up and screamed when Bernie Williams launched a potential game-tying home run off Juan Rincon only to watch it land foul. Williams then struck out on the next pitch. Also, is it me, or is it that this great bullpen the Twins have just can't pitch against the Yankees? The Twins have probably the best bullpen in the American League with the likes of Juan Rincon, Joe Nathan, and J.C. Romero and they all put up great numbers but the Yankees continuously have destroyed them since last year. I distinctly remember Joe Nathan blowing a two or three-run save opportunity against the Yankees last July or August when he hadn't blown one all season before that. He also blew that extra inning game in the playoffs last year. Earlier this season, the Twins blew a late 3-0 lead as the Yankees came back for an extra-inning victory. The Yankees will send Aaron Small to the mound this afternoon to face the Twins' Joe Mays. Hopefully Small can give us a start like he gave us last week in Texas. The Twins don't have the lineup that the Rangers have, but on the other hand they just lit us up for 7 last night. The Yankees, who are still desperate for starting pitching help with Kevin Brown out of the rotation and Carl Pavano's next start pushed back another week, claimed Hideo Nomo off waivers from the Tampa Bay Devil Rays. The Yankees do not have a starter scheduled for Saturday, so in all likelihood Nomo will get the nod against the Angels. Nomo was once a young phenom when he came up with the Los Angeles Dodgers and won the 1995 Rookie of the Year award. He has since been rather nomadic, pitching for six teams including another stint with the Dodgers after being traded to the Mets in 1998. He has never been as good as in his rookie season, and this year has probably been his worst on the mound as he went 5-8 with a 7.24 E.R.A. for the Devil Rays this year before being designated for assignment. I don't see how I can really disagree with this move. I mean he's better than what they have right now for Saturday, which is nobody. At least I think that's better. We all know how he's struggled, but it's not like we're looking for him to be our ace. Just another emergency starter. Admit it. You're the one who said something about a no-hitter in your living room before Juan Castro singled to center to end Randy Johnson's run at a third career no-no. Johnson turned in his best performance as a Yankee last night as he struck out 11 and gave up only two hits in 8 innings. The Yankees' victory over the Twins moved them past Minnesota in the wild card standings and into a virtual tie with Oakland for the wild card lead (the Yankees lead by a percentage point). A-Rod went 2-3 last night with a home run and Giambi was 0-1 but reached base three times (2 BB's and 1 HBP). The Yankees now have the American League's top two leaders in on base percentage in Giambi and Rodriguez. In fact, they also have 3 of the top 6 (Sheffield) as well as 5 out of the top 14 (Jeter and Matsui), and people wonder why the Yankees are still winning games despite so many injuries to their starting rotation. Of course it wouldn't take that kind of production from the Yankees' offense if we keep seeing performances like the one Randy Johson gave us last night. He seems to be heating up as the weather heats up. Hopefully it's not the weather though because we don't get 95 degree days in New York in October. The Yankees' bats will get a good test today as Johan Santana will face them for the Twins against Al Leiter. It's going to be a tough one, but it's kind of big because Kevin Brown will not be making his scheduled start on Thursday so we're going to be capping off this series with another emergency starter. 07/25: So, who do we want? The trade deadline is a week away. Who is on your wish list? Hideki Matsui's 2-run homer in the seventh inning helped the Yankees to avoid a sweep by the Angels. Matsui's homer was his 17th of the year and came at a crucial time. The Yanks were trailing 1-0 in a pitching duel between Mike Mussina and Jarrod Washburn for the Angels. The Moose only gave up that one run in the 1st inning, and it was a manufactured one at that. The Angels threatened in the bottom of the seventh with two men on and one out, Erstad hit the ball directly to A-Rod who was covering the base. A-Rod stepped on the bag and threw the first for the inning-ending double play. They also threatened in the eighth against Tom Gordon, who was relieved by Mariano Rivera. Rivera was able to make short work of Maicer Izturis by making him hit into another inning-ending double-play. Mo pitched a scoreless ninth, and obtained his 25th save of the season. By winning todays game, the Yankees pulled to within 1.5 games behind Boston. The Yanks were 6-5 on this road trip, and by the high caliber teams played with most of their starting pitching hurt, the Yankees should clearly see this as a positive. Next game is Tuesday night back home at the Stadium. The Yankees Randy Johnson (10-6, 4.18 ERA) takes on the Twins Brad Radke (6-9, 3.92 ERA). We score 6 runs, the bullpen allows just 1 ER over 4 and 2/3 innings and we lose. Kevin Brown allowed 7 ER in just 3 and 1/3 innings. Ouch. He walked 4 guys and allowed 6 hits. The Yankees offense put together 12 hits and 3 walks, led by Derek Jeter who went 4 for 4 with 1 HR, 1 RBI and 2 R. Sheffield and Tino had 2 hit days with the 7th (Posada, who walked once) and 9th (Crosby and Bernie) being the only lineup slots to go hitless. Giambi homered again (and led the team with 2 RBI), so he's got 5 HRs in his last 4 games and 11 in July. Cano added his 8th home run (Jeter and him had back to back solo shots) and an RBI of his own. The Yankees had the lead at two seperate points early (1st and 3rd innings), but Brown's performance was just too much for them to overcome. But, as I said, the pen allowed just 1 ER over 4 and 2/3, which is encouraging. Felix Rodriguez had another solid performance, going 1 and 1/3, allowing 0 ER. Groom, Small and Gordon each pitched 1 inning, none of them surrendering a run. The lone run came off of Alex Graman in the 1/3 of an inning that he pitched. He came in in the 4th with runners on 2nd and 3rd and 1 out. Unfortunately, 3 runs were scored (2 charged to Brown) before he was pulled for F-Rod, who got them out of the inning. I'm against trading Felix Rodriguez (well, unless its for someone really good, of course). I think we should keep him and pitch him as the 4th option, for better or for worse and see how it works. We'll try to avoid the 4 game sweep today. Moose (9-5, 3.95) goes against Washburn (6-5, 3.27). Al Leiter went 6 innings allowing 6 ER off 10 hits in his second start as a Yankee. That was all the Angels would get as Scott Proctor provided 2 innings of scoreless relief to close the ballgame. Unfortunately, the Angels held the Yankees to 3 runs on 7 hits with A-Rod and Cano each collecting 2 hits. Cano, Matsui and Giambi each had 1 RBI while Jeter, Cano and A-Rod each scored 1 run. Jeter, Sheffield, Posada and Crosby/Martinez (the 9th spot) went hitless. Cano is now hitting .309 and is on an 11 game hit streak. We find ourselves 1.5 games back of the Red Sox in the division and 1 game back of the Twins (who we'll open a 3 game set with in a couple days) in the wild card. Kevin Brown (4-6, 5.91) faces Ervin Santana tonight (4-4, 5.66). The Yankees pen is rested. I've never seen that before (that I can recall) up until a few minutes ago. I imagine some of you have, though. I was browsing around MLB.com and saw one on auction autographed and I thought... how freaking cool is that? Pretty neat blast from the past. So, a little searching turned up this image, care of DonMattingly.com. When I strike it rich, I'll be sure to buy one. The Yanks started the game very solid. Jeter, who at the time of his first plate apperance was in a 3-32 hitting slump, lofted the ball over Vladimir Guerrero's outstretched glove for a triple. Robinson Cano then promptly brought him in on a soft line drive to center. After Sheffield hit into a double-play, A-Rod smacked his 27th homer of the season and the Yankees took a 2-0 lead. After A-Rod's homer, Giambi had another two home run game to bring his total for the year up to 15. Matsui added another homer, his 16th of the year, in the seventh inning. Randy Johnson pitched 6 innings. He started sharp, but started to lose control in the sixth. Bengie Molina hit a ground-rule double in the sixth after a fan touched the ball. Garret Anderson would have scored from third to tie the game. The fan was escorted out of the stadium giving high-fives to fellow Yankee fans. Apparently he was pulling for the Bombers too. Randy Johnson continued to pitch after this, and slipped on the mound. He was checked out, confirmed to be ok, and was left out there to get Steve Finley to ground out to Giambi to end the inning. That was all for Randy Johnson, as Scott Proctor came into the game to start the seventh. He just couldn't throw strikes and was quickly pulled in favor of Buddy Groom. The Angels got two more on base and Groom struck out Erstad. With the bases loaded, Torre pulled Groom with one out for Tom Gordon. Tom Gordon promptly gave up a grand slam to Vladimir Guerrero. It was Vlad's second career grand slam. Gordon was furious at himself. Michael Kay brought up the fact that Gordon might not have had sufficient time to warm up. Regardless, the Angels took at 6-5 lead and never looked back. The Yanks threatened in the 9th with A-Rod hitting a double against K-Rod. Matsui moved A-Rod to third on a sac fly to center. Giambi struck out. Williams walked to have men at the corners. Then pinch-hitter Posada grounded out to second to end the game. An exciting game to say the least. Even though the Yankees lost, Giambi had a great day at the plate hitting those two home runs. The bullpen has continued to struggle. Let's hope they find just one more middle-relief guy to get them to Tanyon, Tom and Mo. Tomorrow the Yanks take on the Angels again at 10:05 et. Al Leiter (4-7, 1-0 as a Yankee) 6.25 ERA against John Lackey (7-4) 3.97 ERA. Should be an impressive matchup. The rumor of the Marlins being interested in sending A.J. Burnett and Mike Lowell (where would he play, anyway?) to the Yankees for Carl Pavano and Felix Rodriguez was "quickly shot down" and "seemed more like an attempt by the Marlins to shake up the Orioles." The Red Sox may land him by dealing Bill Mueller and Kevin Millar to the Twins for J.C. Romero and Joe Mays and then packaging Mays with Bronson Arrojo in exchange for Burnett and Lowell. The Yankees talks with the Rangers about Soriano (who might be interested in switching to center field) have been "unproductive." The Yankees "had" interest in Tike Redman, but discussions with the Pirates were "unproductive." We are also interested/may be interested in Randy Winn, Eric Byrnes (but the Rockies demands are "too high at this point" and the Yankees interest has been "overstated, according to officials with both teams"), Chip Ambres, Emil Brown, David DeJesus, Shawn Chacon ("lukewarm at best") and Kent Mercker. The Marlins are "not believed" to be interested in dealing Juan Pierre (Blast!). Via the New York Daily News (again), The Star Ledger, the Rocky Mountain News and The Cincinnati Enquirer via Pro Sports Daily. When you mix hot humid air with the best home run ballpark in the American League, add a touch of the Yankees' hot bats with just the right amount of mediocre pitching, you have the recipe for a very long night for Rangers' pitching coach Orel Hershiser. The Yankees touched the Rangers' staff up for six home runs last night as they won the rubber game of a three-game set in Texas by a score of 8 to 4. Jason Giambi and Tino Martinez each hit two, and Jorge Posada and Robinson Cano also homered. What's almost forgotten in this game was a very effective performance by emergency starter Aaron Small, who made his first Major League start since 1996. Small looked very comfortable on the mound, allowing three runs on five hits in 5 and 1/3. He gave us more than Joe Torre could have asked for against one of the best lineups in baseball. The bullpen got the job done again last night, allowing only one run in 4 and 2/3 innings. The combination of Tanyon Sturtze, Tom Gordon, and Mariano Rivera ("TanGorMo" as Michael Kay likes to call them) have been nearly flawless lately, although Gordon did allow one run in the 8th. Rivera pitched in a non-save situation, as the Yankees led by four runs when he entered the game. The most notable performances of last night's game were undoubtedly Jason Giambi and Tino Martinez, who had two homers each. Both were significant because Giambi continues his hot hitting (he has his average up to .284 and his OBP at a sizzling .437), and also because home runs come in bunches as far as Tino Martinez is concerned. It would be great if Tino would get hot right now, especially considering the likely absense of Ruben Sierra for at least the next couple weeks. The Yankees will be in Anaheim tonight to take on the Los Angeles Angels of Anaheim (I do believe that's the first time I've ever used that phrase). The Yanks will send Randy Johnson to the hill to face Bartolo Colon in the first game of a four-game set to finish out this 11-game road trip. For the first time since April 9, the Yankees are in first place as they won a wild and somewhat sloppy 11-10 game at Ameriquest Field in Texas. The struggling Red Sox fell to the Devil Rays 3-1 and the Orioles defeated the Twins in extra innings, meaning the Yankees have a half-game lead over the Red Sox and Orioles for both the division and wild card lead. The bats came through again last night, as the Yankees got to Ricardo Rodriguez early with 6 runs in the 2nd inning. The Yankees hit another three homers (Posada, Sheffield, Matsui), giving them 29 in their last 11 games. They needed all the offense they could get tonight, because the pitching just wasn't there. Kevin Brown didn't look good in his return, although I guess that was to be expected because he wasn't even given a rehab start. Scott Proctor and Wayne Franklin also struggled, and an error by Bernie Williams costed us three runs (none of the three runs given up by Franklin were earned). The bullpen settled down though once Tanyon Sturtze entered the ballgame as he retired all 7 batters he faced and Mariano Rivera pitched a perfect 9th inning for his 24th save of the season. The key hit of the game came off the bat of Ruben Sierra (not surprised, anyone?) as he launched a single to left-centerfield in the 8th that scored both Sheffield and A-Rod and put the Yankees ahead 11-10. Unfortunately, Sierra had to be helped off the field with a hamstring injury and Joe Torre said he will more than likely be put on the DL. Hopefully it isn't TOO serious because he's been maybe our best clutch hitter this season and we're going to need his bat late in the season if this AL East race goes down to the wire. Another notable play of this game and a reason Alfonso Soriano is starting to fall out of favor with me a little bit is a ball he hit off the wall in dead centerfield and only got a single out of it. That ball would have been a sure double for Chili Davis in his late years with the Yankees. Soriano is one of the fastest players in baseball. However, the Rangers' second baseman decided to stand in the box for an extra second, take a little walk and watch the ball, thinking he had a home run as he watched the ball in its entire flight until the ball hit the wall. In the next half inning, Derek Jeter stretched a routine single into a double. Figure that. The Yankees will send Mike Mussina to the mound tonight to face Chan Ho Park. Just for anyone who doesn't know here what the Rangers' lineup can do, Park has an ERA of 5.64 yet he has an 8-4 record. Hopefully the Moose can quiet their bats down a bit. Perhaps there is just something in the water in Florida. Al Leiter pitched his first game for the Yankees in 16 years and gave us a dominating performance, giving up a run on only 3 hits in 6 and 1/3. He struck out 8 Red Sox hitters as the Yankees defeated the Red Sox 5-3. The victory moved the Yankees past the Orioles for second place and only a half game behind Boston for the lead in the A.L. East. The Yankees have also moved into a tie with Minnesota for the A.L. wild card lead. All Yankee runs came by home runs (Sheffield, Posada, and A-Rod). The Red Sox threatened in the bottom of the 9th as Tom Gordon allowed a home run to Manny Ramirez and then walked Kevin Millar before Joe Torre brought in Mariano Rivera. After an errant throw by Cano and two hits, Boston closed the gap to 5-3 before Mo finally settled down and recorded his 23rd save. Both runs scored in the bottom of the 9th were charged to Tom Gordon, so Rivera's ERA dropped to 0.93. It was great to see Leiter come in and pitch like that against one of the best lineups in baseball when we weren't even sure before Saturday if we had a starter for last night's game. Even though he didn't finish the 7th inning, I'd have to say that last night's performance was one of the best performances by a Yankee starter all year. If he can contribute like this for the remainder of the season, then we're in pretty good shape. Kevin Brown will return to the rotation tonight as the Yankees open up a three-game series in Texas. The Rangers trail the Yankees by 2 games in the wild card standings. After what was perhaps their worst loss of the season so far, the Yankees responded yesterday afternoon with a 7-4 victory over the archrival Red Sox. The Big Unit wasn't exactly on the top of his game, but he got the job done. Johnson allowed 4 runs on 8 hits and struck out 10 in 6 innings of work. Red Sox' hurler Matt Clement wasn't as good, as he walked 5 batters and gave up 6 runs in only 2 and 2/3 innings. The bulk of the Yankees' scoring came in the 3rd inning. Clement retired the first two batters but could not find the strike zone all day and it finally caught up to him after he threw behind Gary Sheffield. Sheffield took the next pitch over to the green monster for a double off the wall and Alex Rodriguez followed with a two-run homer. The next four Yankees also reached base, capped off by a two-run double off the left field wall by John Flaherty. Robinson Cano had another good game at the plate, going 3-5 with 3 singles. Cano has now raised his average to .301. This guy is just a solid hitter and it's amazing to see what he's been able to do at the plate in only his rookie season. He plays like he's been here for years. I guess he's just got that personality. He's very laid back and every time he comes up with a big hit or makes a nice play he acts like he's done in a thousand times before. I think he definitely deserves some serious condideration for Rookie of the Year when the season is over. Al Leiter will make his 2005 Yankees debut this evening as he takes on Tim Wakefield to finish this four-game set before heading to Texas on Monday. The Yankees acquired left-handed starter Al Leiter from the Florida Marlins this afternoon for a player to be named. Leiter will start tomorrow's game against the Red Sox. Before the deal was made the Yankees did not have a pitcher on the roster available to start tomorrow's game. The Yankees will pay the rest of Leiter's 2005 salary. Leiter struggled with the Marlins this season, going 3-7 with a 6.64 E.R.A. in 17 games in his second stint with Florida. His disappointing performance led the Marlins to designate him for assignment on Thursday. Speculation began that the Yankees would look to acquire him as soon as they were forced to place Chien-Ming Wang on the disabled list with a shoulder injury. We didn't exactly pick up an ace here, but it will do. The Yankees are just looking for someone who can fill the back of the rotation with all these injuries. He's not the pitcher he was in his first stint with the Marlins or with the Mets, but I don't think he's quite as bad as the numbers he's put up so far this year, either. It also helps for us to have another lefty on the staff, which is something we've lacked the last two years aside from Randy Johnson. Better Leiter than Tim Redding, I guess. Leiter began his career with the Yankees in 1987 where he pitched until '89 when he was dealt to Toronto. His career stops include 7 years with the Blue Jays ('89 to '95), 7 years with the Mets ('98 to 2004), and two short stints with the Florida Marlins ('96 to '97 and 2005). All Joe Torre and Yankee fans could do before last night's game at Fenway Park was hope that Tim Redding could pitch well enough and go deep enough into the game to at least give the Yankees a chance to stay in the ballgame. That didn't happen, though, as David Wells and the Red Sox gave the Yanks a 17-1 pounding to go back to 2.5 games ahead of the Yankees in the standings. Redding only pitched one full inning and came out with the bases loaded and nobody out in the 2nd. He gave up 6 earned runs on four hits. His problem, though, was that he could not throw the ball over the plate as he walked 4 batters. He actually recorded more walks than outs. Darrell May came in for relief and didn't do too much better as he also gave up 6 runs. This was the second time this season the Red Sox beat the Yankees by a margin of 16 runs, with both games ending with the score 17-1. It was a tough one to swallow, but what could you really expect? I mean I wasn't thinking 17-1, but as soon as I heard we'd be throwing out Tim Redding last night to face David Wells it didn't look good. It looks like we might have to deal with this every 4th and 5th day for at least a week or two before Carl Pavano and Kevin Brown are ready to return. On another note aside from pitching, it is clear now that Melky Cabrera just isn't ready for the Major League's yet. He made a horrible misjudgement in centerfield that allowed Trot Nixon to go all the way around the bases for an inside the park home run. He's got a rocket for an arm and will usually give us one decent at-bat each game, but he's just not ready yet. We obviously need to give him time. The guy is only 20 years old. I'm hoping that Joe Torre and Brian Cashman don't think that just because they brought up two guys from Columbus earlier this year who came up and surprised everyone they can fill any hole by going into their farm system. Cano and Wang were ready for the big leagues. Cabrera isn't yet. I guess the only bright spots last night were Robinson Cano and Gary Sheffield, who had two hits each. Today everyone will get to see the game as Randy Johnson will take on Matt Clement in an afternoon affair on FOX at 1 p.m. We're really going to need this one today and Randy Johnson has to step up because we still don't even have a pitcher for Sunday yet. On a totally different note, I'd just like to throw in my favorite stat of the day: Former Yankee Mike Stanton balked in the winning run last night in his Nationals' debut before even throwing a pitch. In his last start with the Yankees, Orioles' 2B Brian Roberts put Stanton's first pitch in the stands for a walk off home run. So that means Stanton is now 0-2 with a total of one pitch thrown in his last two appearances. The Yankees today placed their most consistent pitcher this season on the the DL. On Thursday, the Yankees placed rookie right-hander Chien-Ming Wang on the 15-day disabled list with right shoulder inflammation and purchased the contract of right-hander Tim Redding from Triple-A Columbus of the International League. The Yankees will win the East. 1 - Ruben Sierra said so. 2 - Gary Sheffield has A-Rod's back. 3 - Jason Giambi has found his swing at the plate. 4 - The Yankees are hitting their stride. While their rivals in the East are falling like dead weight. 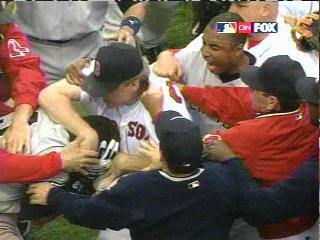 With the "Idiots" in Boston, there is too much team fighting. With the O's its their lack of quality starting pitching. Based on the Yankee bat alone will the Yanks soar past these two teams. A documentary on the life and times of Mickey Mantle will appear on HBO tonight at 9pm edt. The one-hour HBO Sports special explores the life and career of one of baseball's most enduring icons, Yankees slugger Mickey Mantle. August 13, 2005, marks the tenth anniversary of the death of Mickey Mantle, who lived a life as rich and extraordinary as a Hollywood script. Over the 18 seasons with the Bombers, despite constant nagging injuries, Mantle hit 536 home runs, twice hitting more than 50 in a season. He finished ten seasons with a batting average of .300 or more, and played in seven World Series. Today, "The Mick" remains the greatest switch-hitter in baseball history. At the height of his career, Mantle was the toast of New York, yet behind his country charm and good looks there was a wayward lifestyle that harmed his marriage, his relationship with his four sons, and his health. In 1995, during a procedure to replace his damaged liver, he was discovered to have inoperable cancer. Mickey Mantle died a little more than two months later in Dallas.. Interviews for the special include Mantle's wife Merlyn, who still resides in Dallas, and their sons David and Danny Mantle; Billy Martin Jr., son of Mantle's teammate and close friend Billy Martin; broadcaster Bob Costas, who delivered the eulogy at Mantle's funeral; Yankees principal owner George Steinbrenner; teammates Jim Bouton, Bobby Murcer and Phil Linz; and manager Ralph Houk. 07/13: "How many would we have - everybody?" "I wouldn't make one step without knowing if Mr. George will allow us to play," closer Mariano Rivera of Panama said before last night's All-Star Game, referring to Yankees owner George Steinbrenner. "That's his players. I'm not so sure ." Rivera wondered what effect it would have on a team like the Yankees, who figure to have numerous players picked for the WBC representing several nations. "How many would we have - everybody?" Rivera joked. "To be away from your team for two weeks in spring training, that's a big deal." The idea, in theory, is a good one. But, as a Yankees fan, do I want Mo having to get ready earlier, play a high level of baseball earlier and, as a result, be even more taxed in October? Even though most other great players in the league will also be taxed in the same or a similar way from playing the event - honestly, not really. Cliff Corcoran had a great suggestion - why not hold it in November? They'd have three full months off before Spring Training. Is it too late to change? 07/13: "It's going to be different." The truth is that for the first time in his Pinstriped career, Alex Rodriguez can go into the lion's den that is Fenway Park and know in his heart that he is being protected by his Yankee teammates. As Sheffield promised, "It's going to be different." It's nice to see. I'm pretty sure they already had his back for the most part... it's not like that fight last year was him alone. The Yankees got out there and got into it a bit - Bernie was pretty hyped, as I recall. It looked like perhaps not each Yankee selected to this year's All-Star game would get a chance to play as Bob Wickman entered the game to close out the N.L. Stars with a 7-3 lead in the 9th. However, after two runs were given up by both he and Orioles' reliever B.J. Ryan, Mariano Rivera came into the game with a 7-5 lead and two outs. Mo struck out Astros' slugger Morgan Ensberg to record the save. Alex Rodriguez started the game at third base and went 1-2 with a single and a walk before being pulled in the top of the 5th for Orioles' 3B Melvin Mora. Gary Sheffield entered the game in the 6th inning and grounded into a double play before being replaced in the 9th inning by White Sox OF Scott Podsednik. Other highlights from the game included a long home run from Miguel Tejada, a home run from Mark Teixeira which was his first this season from the right side of the plate (he has 25 home runs overall this season), a spectacular play at second by Marlins' 2B Luis Castillo, and a nifty double play turned by the Orioles' middle infield combo of Tejada and Brian Roberts. Tejada, who went 1-3 with a solo shot won the game's MVP award. Overall I'd say it was a fun night. You can say what you want about the idea of the All-Star game deciding home field advantage in the World Series (I'm still not 100% sold on it), but I am certainly glad that if the Yankees do get the opportunity to play in the World Series, they won't have to open up the series in St. Louis or Washington (not saying that one of those teams will win the N.L., but those are two of the toughest places to win on the road). Hopefully the break served as a good rest for all the Yankees who weren't invited to this year's mid-summer classic. We got a tough stretch coming up with a four game series at Fenway starting Thursday to start an 11-game road trip that also includes stops in Texas and Anaheim. By Michael, Patrick and Seamus. As we're now at the all star break, we thought that we would take a look at the first half performance of each individual Yankee. Certain players that have not had much time with the Yankees or had an opportunity to be with the Yankees for very long have been excluded. These include Jason Anderson, Wayne Franklin, Darrell May, Scott Proctor, Melky Cabrera, Sean Henn, Colter Bean, Andy Phillips and Kevin Reese. We have the guy (Alex Rodriguez) who is T5th in the MLB and 2nd in the AL in home runs. And he didn't even get an invite. How close were Tony Womack and Tino Martinez to making this team?! Seriously? Baseball is an International game. You don't need to divide the participants of the MLB home run derby into countries. If this were the olympic or world cup home run derby - fine, cool. I'm with you. But, otherwise... this is the MLB home run derby. What they do in the MLB matters. Not just where they are from. I might not completely skip it (as I boldly predicted to Seamus last night), but... I might. Will I be curious to see who won? Sure. It is fun to see the guys swing for the fences because they're having fun, laughing, etc... no matter who it is. So, I might watch a little bit - or I might just have other things to do. Randy Johnson started the game a little off. His first pitch was hit for a double by Grady Sizemore. But it wasn't long into the game before he settled down and powered the Yankees to another win. Jason Giambi hit his 5th home run this week, and raised his average to .278. Gary Sheffield put the game away with his three-run shot in the eighth. And Hideki Matsui hit successfully in his eleventh game with three hits today. In the last seven days, Giambi has an .556 BA with an .619 OBP. These are the numbers that Yankee fans are expecting of our first baseman. The Unit picked up his 9th win, and gave up three runs in nine hits over six innings. We are now at mid-season with the All-Star break coming up. Let's hope the Yanks continue to build on their momentum, get Brown and Pavano back healthy, then they should be set to face some stiff competition in the Red Sox, Rangers and Angels, all of which starts this Thursday. The Yankees 6 game winning streak comes to an end as they lost 8-7 to the Indians. Other than losing and Darrell May, it really wasn't that bad of a game (yeah, I know that sounds kind of stupid). But, May in his first game as a Yankee, allowed 7 earned runs over 4 and 1/3. After that, the Yankee pitching was pretty solid with Scott Proctor (2 and 2/3 IP, 0 ER) and Sturtze (2 IP, 1 ER) combining to allow only 1 in the final 4 and 2/3. The Yankees were able to score a run off of each pitcher they faced (Elarton, Howry, Rhodes, Wickman). Things were looking good in the ninth, as Ruben lead off with a homer to bring us within one, followed by a Bernie Williams single and a Derek Jeter bunt single. Unfortunately, Cano grounded into a double play with Womack (in for Bernie) advancing to third. Sheff walked and A-Rod grounded out to end it. So close. The Yankees put together 11 hits, including a 3 for 4 day by Ruben Sierra (2 R, 1 RBI) who is now batting .283 (when did that happen?!). He was batting .205 through June 26, but a 6 game hit streak has him at .283. Cano was the only other Yankee with more than 1 hit and Sheffield, Matsui and A-Rod (in addition to Sierra) hit home runs. The Red Sox lost 9-1 and the Twins are losing 10-6 in the bottom of the 6th as I write this, so hopefully we won't lose any ground. Randy goes against ex-Yankee Jake Westbrook tomorrow in our final game before the break. It didn't take long for the Yankees to establish themselves last night at the plate. By the third inning the Yanks were leading 3-1. Alex Rodriguez started the offense in the first by hitting a two-run blast. It also allowed him to tie Manny Ramirez and Mark Teixeira for the most in the american league at 22. Jason Giambi hit his 9th homer of the year in the second, a solo shot, that was almost robbed by the Indian's right fielder Casey Blake. It was also the first game for twenty year old Melky Cabrera in center who went 1-4 at the plate and played a solid center field. Mike "Moose" Mussina pitched a solid 7 innings and gave up two runs on six hits and struck out five. A bit of bad news as Tom "Flash" Gordon left the game after striking out two in the eighth. He will have an MRI on his arm today due to shoulder tightness. It was his first game since last Sunday, but the MRI will be precautionary. Gordon told Torre he might have slept on it wrong, and doesn't feel like there is something "major" wrong with it. The Yankees just won their 5th straight. The momentum is high, and they are within striking distance of Boston being 3 1/2 games out. Hopefully we can pull close before the All-Star break, get our pitching staff healthy, and keep rolling in the second half of the season. Update: Carl Pavano was placed on the 15-day disabled list today. The MRI turned out to be negative on Carl Pavano's shoulder. It is still questionable when he will pitch again. For now the team is taking it day by day. Carl Pavano missed his last start due to discomfort in his pitching shoulder. Reliever Tanyon Sturtze took his place in the rotation. Torre doesn't seem to think that Sturtze will be starting again for Pavano. One possible replacement would be new Yankee Darrell May who was aquired in the Paul Quantrill trade last week. May has a 5.61 ERA and a record of 1-3 for the Padres. May did pitch 7 solid innings for Columbus on Monday. I mentioned it briefly a few days ago and now it looks like Melky Cabrera will get a shot at the majors as he'll be starting tonight. Via Alex Belth via Steve Lombardi. The White Sox Scott Podsednik edged out D. Jeter to take the final spot on the AL All Star team. For me, one of Jeter or Matsui really should be on this team, at least. Cliff Corcoran over at Bronx Banter put together a team I'd much rather see. There is an article today in The Journal News detailing the work of a clubhouse manager, including stuff like player/manager requests, the various amenities they have, food they prepare and the like. In the visiting clubhouse at Yankee Stadium, Lou Cucuzza stocks a full deli with hot dogs and hamburgers, grilled chicken, fruit-and-veggie trays and pizza. Hideki Matsui was thrilled that Genzale and Thalblum had sushi for him on the West Coast. But most places serve food indigenous to that city: barbecue in Kansas City and Texas; salmon in Seattle; clam chowder and lobster in Boston; deep dish pizza in Chicago; Asian food on the West Coast; bratwurst in Milwaukee. "Philadelphia is probably the best one," Mets third baseman David Wright said. "They have cheese steaks or they'll make whatever you want. They have good ice cream, too." The postgame spread is usually two or three entrees, with vegetables, salad and a starch such as potatoes or rice. "We cater Mexican from a local restaurant," Thalblum said. "The biggest thing going to Oakland is the Mexican." Genzale will always serve fish. "When you come to Seattle, you're going to get salmon," he said. At Fenway, half the clubhouse seems to be taken up by Tom McLaughlin's spread, beginning with pizza and submarine sandwiches pregame and steak, pasta, lobster and shrimp postgame. Sounds like they eat pretty well, anyway. Yankee hitters certainly got the memo Tuesday about how Randy Johnson was pitching on only three days rest. The lineup did all they could to help him, but it turned out he didn't really even need it as he gave up just 2 runs in 7 innings as the Yankees blew out the Orioles 12-3. Yesterday's start by Johnson was the first regular season start in which he pitched on only three days rest since a tie-braker game with the Mariners against the Angels for the AL West title in 1995. Orioles' pitcher Rodrigo Lopez also went on just three days rest but wasn't nearly as effective. The Yankees rocked him for 10 runs on 11 hits in just three full innings pitched. Jeter, Matsui, and Jason Giambi each had three hits, including a home run each for Matsui and Giambi. Gary Sheffield and Alex Rodriguez also homered. 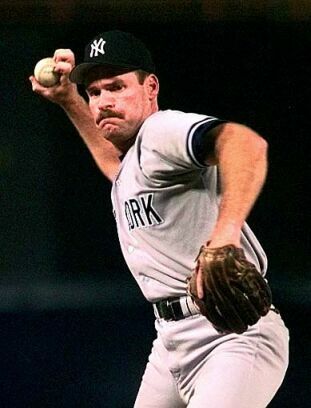 The only Yankee starter without a hit was John Flaherty, who really isn't put out there for his offense anyway. Jason Giambi followed what was probably his best performance in two years with perhaps an even better performance as he went 3-4 with a home run and two doubles. Giambi has hit 3 home runs in the last two days and has raised his average to .268. It's quite an accomplishment considering he was on the interstate before that series in Oakland when Joe Torre started putting him in the lineup more consistently. He is probably just a 1-3 or a 2-4 away from pushing his average up to .270 and his .420 OBP would be good enough for 2nd in the American League, although he does not have enough plate appearances to be eligible (at least the ESPN.com leader board doesn't show him on there). I reckon those numbers would at least put him on par with most other 1B in the A.L., considering the general lack of 1B who have performed well in the A.L. so far this season. Hideki Matsui's 3-hit game brought his average up to .317. He is now only one point behind A-Rod for the best batting average on the team and is 7th in the American League. He is tied for 4th with 65 RBI. It's really unfortunate because he does deserve to be on the All-Star team with those numbers. Unfortunately though, Matsui's numbers weren't that high throughout most of the voting period and he's gotten so hot over such a short period of time that it's kind of hard to grab everyone else's attention. The Yankees' victory kept them just 4 games back of the A.L. East leading Red Sox. The Yankees have the day off today before starting a four-game series against Cleveland at the Stadium to finish out the first half. 07/05: "Will you fight for me?" In January, Jason Giambi sat down at a long conference table in the midtown law office of Yankee president Randy Levine, alongside his agent, Arn Tellem, and the team's general manager, Brian Cashman. They all stared at a speakerphone. "Will you fight for me?" came the voice on the other end. "I'm with you," Giambi answered. And with that, all talk of the Yankees trying to sue Giambi for breach of contract, of trying to shuffle him out of New York, ended: George Steinbrenner had spoken. Giambi has rebounded from an early season slump. Since June 1, he is hitting .304 (21 for 69) with 3 home runs, 12 RBI, 10 runs and a .467 OBA in 24 games. If he can continue to hit in that area and get on base like that, he'll be fine. By using an seven-run 8th inning, the New York Yankees came from behind to defeat the Baltimore Orioles. Tanyon Sturtze, the most reliable Yankee middle reliever this season, was used as a spot starter today in place of injured Kevin Brown. He pitched effective until the 4th inning when he started missing his spots. Surprisingly Bruce Chen of the Orioles lasted only 1 1/3 innings as the Yankees hammered him for 6 runs. Last May he had a complete game against the Yankees and was very commanding. Not this time. The Yankees seemed to put the ball anywhere they wanted, and he was quickly pulled. But the Orioles clawed back into it to take the lead in 7th going up 8-6. The Yanks started the 8th with Giambi hitting his 7th HR of the year. Ruben Sierra pinched hit for Tony Womack and blooped a single into right field. That was enough for the Orioles to excuse their current pitcher Steve Kline. B.J. Ryan entered the game and things didn't get much better from there. The Yanks then went on to score 7 runs and take a 13-8 lead. Mo came in and closed out the game. There were four batters HBP today, with no warnings to the pitchers given. Sheffield took a nasty pop to his hand by Todd Williams, but it appears Sheff is ok. He continued and played the rest of the game. This makes 3 straight wins for the Yankees. Look for them to come out strong tomorrow against the Orioles who used most of their bullpen today in relief of Chen. Tomorrow Randy Johnson (7-6) 4.24 ERA goes against Rodrigo Lopez (7-4) 4.43 ERA. Both pitchers are going on 3 days rest. Game time at 1:05pm on ESPN. Via Pro Sports Daily, I noticed a number of pieces speculating on the Yankees interest in Bret Boone. These articles include quotes like "A few teams, such as the ... Yankees, have the need and the wherewithal to acquire Boone to be their second baseman." Do we have a need? The best I can figure is that Cano has looked a little iffy on defense at times. Boone looks like he is a very good defender - having won 4 Gold Gloves and 3 in a row (2002 through 2004) at second base. He's also a career .288 postseason hitter in 31 games. He's having a rough year at the plate and last year wasn't a particularly great year for him, either, although he still drove in 83 and hit 24 homers. Could Cano be a temporary solution in center with Boone temporary playing 2B (this year)? Is that a way that we can improve the CF situation (with a couple of side effects, such as improving our infield defense and our lineup as Boone and Cano in the lineup means that Womack won't have to be in it) and not trade any prospects? Then, possibly we can afford to acquire one big fish? George Steinbrenner turns 75 today. Bud Selig, Howard Rubenstein, Donnie Baseball, D. Jeter, Buck Showalter and Tino share some thoughts on the Boss. The AL All Stars have been announced. The Yankees who made the team were A-Rod, Mo and Sheff. A-Rod will start at 3B. Matsui and Jeter are nominated, along with Carl Crawford, Scott Podsednik and Torii Hunter, for the final man vote on MLB.com. Go over and vote. Having two Yankees on the ballot has terrible political ramifications... the Yankee vote is split! Anyway, I really think one of them should have made it. For instance. You don't need 3 first basemen on the team. Sweeney is the only Royal, so he has to be there. But, Konerko, I don't think so. In the outfield, while Ichiro Suzuki has to be on the team as a Mariner - Garret Anderson doesn't. As for the DH reserve, must you pick a reserve DH? I mean, really? If so, I don't agree with it, but anyway... Shea Hillenbrand's numbers just aren't there. Also, keep in mind that the team has 1 backup C, 2 backup 1B, 2 backup middle infielders, 1 backup 3B and 3 backup OF. You have 1 backup for every position except for 1B. It's not like it was a strong 1B year, either. Tino was leading most of the time. I really think they should have gone with 1 less 1B and 1 more middle infielder (Jeter), at least. I think Matsui should have made it instead of Anderson and Jeter should have made it instead of Konerko (assuming there has to be a "DH reserve"). For all the chatter that goes around about the fans not being able to pick a good team, it looks like the fans picked the most deserving players at each position (or close). Meanwhile, the players noticably botched a couple in my eyes. One of Matsui or Jeter should have made the team. At least. The Yankees stayed the course and took the series against the Tigers with a 1-0 victory in front of 40,056 in Detroit. Chien-Ming Wang dominated the day pitching shutout ball through 7 innings. Tom "Flash" Gordon and Mo finished off the game through a solid 8th and 9th. I will have to admit that I got a bit anxious in the 9th after Rivera gave up a double from Ivan Rodriguez on a long fly ball into left field. Matusi was able to track it down and keep Pudge at second. Mo then got Dmitri Young to ground out, Chris Shelton to strike out, and Craig Monroe to ground out to A-Rod to end the game. Obi-Wang was a little chaotic on the mound, hitting 3 batters during the course of the day. He plunked Polanco twice and then hit Pudge. Chaotic, but effective, as it was clearly not intentional seeing that the game was hanging in the balance of just one run. The Yankees scored that only run in the 4th when Gary Sheffield singled in Robinson Cano. Other than that the bats were silenced against some great pitching from Nate Robertson. It's unbelievable this guy is 3-7 with an ERA of 3.35. Tomorrow, the Yanks continue to fight it out against the Baltimore Orioles at Camden Yards. Bruce Chen (6-5) 3.54 ERA takes on Yanks reliever Tanyon Sturtze (2-1) 3.43, making his first start of the year. Game time on Independence Day is 1:05pm. And yes, it's on ESPN. A couple of stories caught my eye this morning. Otherwise, Cincinnati would love to unload Griffey's contract on the Yankees, just as Colorado would be thrilled to get rid of Wilson's. Ain't happening. "We're out of that business," the Yankee operative said, adding that the avowed refusal to mortgage any more of the team's future for older, more expensive players may limit their trading activity to nothing more than a further fine-tuning of the bullpen. I hadn't thought of that. Could Cabrera give us a spark? The Red Sox have no interest in ERIC MILTON and shouldn't, because he'd get killed in their park. But Milton will draw interest from National League teams and possibly (if they ever jump into the pitching market) from the Yankees, who tried to sign him last winter and couldn't. The sides differed by $1 million per year on a three-year deal and neither budged, so the Yankees instead signed JARET WRIGHT, who clearly hasn't worked out. The game was scoreless through 3, but in the 4th 5 runs were scored. Unfortunately, only 1 of these was by the Yankees (a fielder's choice ground out by Jorge resulting in A-Rod scoring). And so, they went down 4-1 early. But, that would be all the Tigers would get as Mussina (2 IP after the 4th), Gordon (2 IP) and Mo (1 IP) combined to prevent the Tigers offense from scoring a run in the final 5 innings. The Yankees would pick up 2 in the 6th (2 out, 2 RBI single by Bernie) and 1 in the 7th (Sheffield doubled in Jeter) to tie the game up and that is how it would remain heading to the 9th. Troy Percival relieved Kyle Farnsworth and retired Sheff on a deep fly to left. A-Rod doubled. Matsui popped out to shortstop. 2 outs, man on a second for Tony Womack. The count quickly goes 0-2. Then Tony Womack puts a single into center field - Yankees lead 5-4. But, it wasn't over. With Womack at first and Posada at third, Bernie Williams smacked a 1-0 pitch over the right field fence. I just watched the replay over at MLB.com and he got into it. Thing of beauty. After a 1-2-3 9th from Mo, the Yankees had an 8-4 victory. All told, the pitching wasn't that bad. 4 runs isn't ideal, but they only allowed 7 hits (with Gordon and Mo failing to allow a hit) while walking 1. Gordon got the win, taking him up to 2-3 on the year. The Yankees offense was solid, scoring 8 runs over 13 hits and 5 walks. Bernie Williams led the offense with a 4 for 5, 5 RBI night. This takes his batting average up to .261 and his OBA up to .350. He's pretty close to his numbers of the last two seasons in those two categories. It is worth noting that all 5 of his RBIs came with 2 outs. Cano and Matsui each added 2 hits of their own (Cano had his 2nd triple of the year, but didn't reach home while Matsui scored once). A-Rod was 1 for 4 but scored 3 runs on the day. The only lineup spot to come away hitless was Posada in the 6th spot, but he scored once and came up with 1 RBI. Sheffield and A-Rod hit their 18th and 17th doubles of the season, respectively. Obi Wang (4-3, 4.26) goes against Nate Robertson (3-6, 3.58) at 1 PM eastern this afternoon. San Diego area papers are reporting that the Yankees have dealt Paul Quantrill to the Padres for Darrell May and Tim Redding. Seems like a trash for trash deal, so to speak. But, who knows. Maybe one of them will do something useful with a change of scenary/coaching. Or not. Not like we're loaded with options, right? It'd be great if we could deal Stanton for Encarnacion, though. (Would the Marlins really do that?) I read they had interest in Quantrill and Stanton and could deal Encarnacion. They can have both. Randy Johnson again allowed 7 ER (this time over 5 IP and not 3) as the Yankees lost 10-2. The Unit was pulled for Scott Proctor who gave up 3 more in just an inning of work. Jason Anderson got his first work as a Yankee, pitching 2 scoreless innings to finish up the game. The Yankees were held to 2 runs on 8 hits and 2 walks by Jeremy Bonderman, who pitched a complete game. Robinson Cano was the only Yankee with 2 hits. Godzilla hit his 11th homer of the year as he notched RBI number 60 (Sheffield drove in the other run). We now find ourselves back at an even .500., tied for the 16th best record in baseball. We are still only 6 games back in the division and 4.5 games back in the wild card standings. Today Carl Pavano (4-6, 4.77) takes the hill against Sean Douglass (1-0, 1.50). Edit: "Rocket Shelled" as the title originally. I had Clemens on the brain when I wrote this entry. Not sure why. I tend to think of Clemens when I write about the Unit.